You have a couple more ways to work with tonality in Photoshop — the toning tools. These two brush-using tools let you paint corrections on your image, giving you incredible control over the appearance. Select the Burn tool to darken or the Dodge tool to lighten. Select a brush tip in the Options bar and drag the tool in your image to apply the correction. (Read about controlling the brush-using tools — and that incredibly-complex Brushes palette — in Chapter 14.) In Figure 5-19, you see the Burn tool darkening a specific area of the fence on the right. 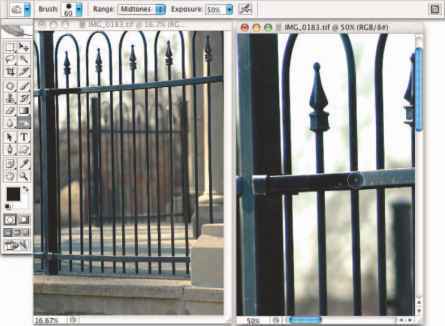 Figure 5-19: "Painting" the fence with the Burn tool — where is Tom Sawyer when I need him? The Dodge tool is great for minimizing (without removing) shadows in an image. You'll find it particularly useful for reducing wrinkles in faces and other such jobs that require lightening specific areas of an image. Figure 5-20 compares the original (left) with a working copy in which I'm using the Dodge tool to reduce the appearance of the wrinkles. 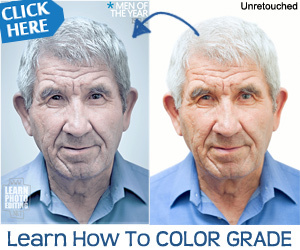 By reducing rather than eliminating those wrinkles completely, I retain the character of the man's face as well as prevent that phony just-out-of-plastic-surgery look. Figure 5-20: Use the Dodge tool to minimize wrinkles without removing them. For most of the work that you do with the Dodge and Burn tools, the default Exposure setting of 50% is way too strong. In the Options bar, reduce the Exposure to about 12-15% for most work. And unless you're specifically working on lightening shadows or toning down highlights, set the tools' Range to Midtones in the Options bar.